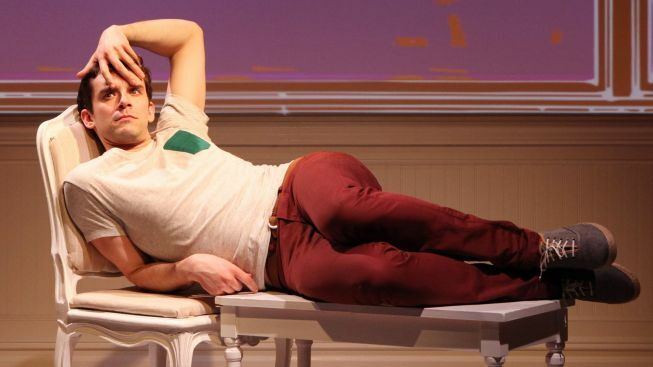 Michael Urie needs to kick back after a day at work for his demanding boss in "Buyer & Cellar." There’s an alternate universe in which, late one evening, Michael Urie returns to his dressing room after a performance of “Buyer & Cellar” and there’s a knock at the door. “Who is it?” Urie asks. This scenario hasn’t played out at the Barrow Street Theatre in New York, where the inventive Streisand-centric comedy runs through Jan. 5, at least not yet. But when “Cellar” moves to L.A. next summer, it becomes even more likely that its subject could pay a visit. Gulp? Stage vet Urie (“How to Succeed...,” TV's "Ugly Betty") isn’t worried: “Barbra knows how to find things funny, and she knows how to find ‘the funny’ in things,” he says. Playwright Jonathan Tolins took inspiration for “Buyer & Cellar” from Streisand’s 2010 book, “My Passion for Design,” which showcases the recording star’s Malibu dream house, including the street of shops in the basement of a barn on her estate. That underground “mall” is where Urie’s struggling actor, Alex More, gets a job as the solo play begins. NBC4NY sat down backstage with the affable 33-year-old to talk about how “Buyer & Cellar” can both poke fun at, and show reverence for, its glittery subject. NBC4NY: I’ve heard conflicting reports about Barbra’s spies having seen “Buyer & Cellar.” Can you set the record straight? URIE: People close to her have seen it, people who work with her on her concerts and publicity. There’s been no Donna Karan. There’s been no Brolin. There’s been no Jason (Gould, her son). But people who’ve worked with her have come, and they’ve been very kind and very nice. ... I’m of the mind that the more mythical she remains, the better I’ll be in the play. NBC4NY: I’m sure you’ve fantasized the imaginary dressing room conversation. You return there after a show and there’s a knock: “Michael, can we tawk?” What would you say? URIE: I would say: “It’s nice to meet you. I hope you liked it.” I’d say: “I love you, as do all the people who come in through our doors.” Beyond that, I’d have to let her take the lead. I imagine if it got to that point and she were here, she would have enjoyed it ... right? NBC4NY: “Buyer & Cellar” is built around this idea of the real-life mall in Barbra’s basement. It’s a pretty funny thing for we mortals to imagine. Do you think the play is kind to her? URIE: I do. I think there are snipes taken, mostly by Barry (Alex’s boyfriend, voiced by Urie), but I know Jon (Tolins) and I, and the director (Stephen Brackett), took great care in rehearsals to make sure it was fair and kind, and only what we found funny, as opposed to malicious. Barry is mean, and he says mean things, but the opinion of the piece and the narrator is love ... with the caveat that having a mall in your basement is funny. NBC4NY: I didn’t know about Barbra’s book. I went to Amazon and read the reviews. Her fans adore it. URIE: Some people don’t believe it’s real! NBC4NY: Do you think she considered that displaying her wealth in such a way could make her an object of ridicule, or is that my own baggage? NBC4NY: That’s a gracious way to look at it. URIE: Look, to an extent I can relate to the idea that she wouldn’t find the play funny. But the mall in the basement is funny. I don’t have that kind of money, and I will never have that kind of money ... I don’t think that kind of money even exists in show business anymore. But I can respect and appreciate that in the book, she’s simply sharing her style and her passion for design. NBC4NY: You don’t so much do an impersonation, as a gentle mimicking of Barbra’s New York accent. Did any particular film or era provide the inspiration? URIE: “Meet the Fockers.” There’s a certain sensibility in “Hello, Dolly,” “Funny Girl” and “What’s Up, Doc?” that’s the same as in “Meet the Fockers,” but “Meet the Fockers” has the age and the maturity, which we needed. When we first started, I was doing “What’s Up, Doc?” and it was too youthful. It wasn’t the Barbra we know. Her interviews weren’t helpful, because she’s withholding in interviews, and you don’t see the fun, silly Barbra who maybe doesn’t exist at all, but that she is in movies, and that she is in this play. When she plays those fun parts, that’s real. Whether or not she has a sense of humor about the basement, she is able to find things funny, and to find “the funny” in things. NBC4NY: You’ve had a number of celebrated backstage visitors. Your Juilliard classmate Jessica Chastain. Sarah Jessica Parker and Ralph Macchio. And Nick Jonas, your “How to Succeed...” co-star, who’s been twice. Let’s drop some more names. URIE: James Franco came. That was very cool. And then he wrote an article about the play. Well, he wrote about a bunch of things he did in New York on Vice.com. He talked to me about his theater projects, and my process with this play. ... And Barry Manilow came, when we were doing it at the Rattlestick. That was so cool. He’s very down to earth. He loves Barbra. I think he’s hung out with her. And he said that he thinks she’d like it. NBC4NY: That’s close to a blessing! On the subject of entertainment legends, you were just on an episode of “Hot in Cleveland.” What was it like working with Betty White? “Buyer & Cellar,” through Jan. 5 at the Barrow Street Theatre, 27 Barrow St. Tickets: $75. Call 212-868-4444 or visit smarttix.com.